Old or Archived "Hot Updates"
Pentagon Kiss and Ride Lot Changes (17 Apr 03) - Due to construction, the North Parking Kiss and Ride lot has been closed and re-located to the South Parking lot effective 16 Apr 03. It does not appear as though this will impact slugging. Please post comments on the message board regarding any impacts. Here is some additional information. San Francisco has Newspaper Article on Slugging (25 July 02). The San Francisco Chronicle printed a short article on casual carpooling. Read article. Horner Road Expanded Lot is Open. Newspaper Article on Slugging in The Hartford Courant (5 July 02). Slugging continues to stay in the news - even in Hartford Connecticut! Read article. Newspaper Article on Horner Road (25 Jun) - Lane Ranger of the Potomac News answers questions regarding Horner Road lot and Potomac Mills in the 24 June issue. See News and Radio. SIX new slug lines Proposed (25 Jun ) - See the new category on the Message Board. Possible lines include: Union Station, Route 630, Vienna, Springfield Mall, 18th Street, and a new added Rt 17 to L'Enfant. New Category on Message Board (21 Jun ) - A new category was added to the Message Board for those interested in starting NEW slug lines! Polling/Survey to Start (21 Jun) - A fellow slug had a great idea of surveying each slug line to help slugs/drivers determine the best pickup times! If you knew there were a lot more drivers/slugs to your destination at 0645 instead of 0700 it might make the slugging experience a little easier. Look for the survey's in the next week. Safety Issues at Tackett's Mill (14 Jun) - With the growth and popularity of the Tackett's Mill slug line, some concerns about safety have surfaced. VDOT may assist from a safety standpoint. See Message Board (under the Morning Slug Lines folder, or click on Active Topics). Message Board Topics (13 June) - There are over 450 postings on the Message Board. Please support Slugging by sharing your knowledge with others. See Message Board. Interactive Lost and Found Database (13 Jun) - The Lost and Found database has helped hundreds recover lost items. Postings are 'real time' so your item is displayed immediately! See Lost and Found. Route 3 Slug Line Gets off to Great Start (4 June) - The new Rt 3 Gordon Road line is off to a great start according to dozens of emails received yesterday. For more info see the map and description at Rt.3 Gordon Rd. Dozens of Signs for Download (4 June 02) - For those needing to hold up signs for their destination, there are dozens of signs already made and ready to print on this site. Click here for more info. Newsletter #6 Published (27 May 02) - The most recent Slug-Lines.com Newsletter (#6) was emailed on 26 May to over 1000+ slugs and drivers on the mailing list. Join now and get the latest highlights. We don't bombard you with email either - newsletters are about once month or less. New Maps Posted (14 May 02) - New maps have been posted for L'Enfant Plaza, Pentagon, and Crystal City North. Rosslyn Line Traffic Volume (2 May 02) - It's amazing but a survey of the Rosslyn line revealed that in a two hour period the Rosslyn line moved 327 people/206 cars!! That means that the 327 people slugging are not driving which obviously reduces congestion on the highways. The numbers indicate a strong statement on the popularity of slugging in Rosslyn.
" Hi Slugs, Welcome to the new people on the list. I am getting 5 new names per day. This thing really is starting to explode. There are a lot of ideas going back and forth in the emails and someone has to make a decision. Here is what I think after going thru over 100 emails. In the beginning we should use the Pentagon Fredericksburg sign as our return point for the afternoon. It's not that hard to separate between the 17 and 3 slug lines. As for the morning line I am going to call the Winn Dixie property management tomorrow and see what they say. I think the Winn Dixie lot is perfect. Plenty of room, and 100 yards from the Urkops lot. The only drawback to using WinnDixie lot is at some time in the future we may have to abandon this site if they fill the building with a new tenant. At that point we could just move to Ukrops. From what the VDOT people are saying, if we cram the Ukrops lot, we force them to take action by providing more parking. I will let you know tomorrow what Winn Dixie says. Then it's time to make a final decision. Also, we must get the word to the drivers. everyone needs to print out the flyer attached to this email and carry 20 copies with you. Give to all drivers. I am going to make some 3x3 large signs to put up for drivers to see. Keep working gang, we are almost there!!! Thanks to all, Todd"
Crystal Gateway Flyer now available (26 Apr 02) - Click here to VIEW or DOWNLOAD. Crystal Gateway Slug Line will Relocate! (25 Apr 02) - Negotiations between Traffic Management officials and the Arlington County Police regarding the safety issues with the slug-line at the northern end of Crystal City have ended. The decision was to relocate the slug line on 29 April 2002. The new location will be about 75 yards East of the current location. This will be the curve on S. 12 Street where it goes from one way to two direction traffic. Traffic Mgt will be removing about 6 parking meters to allow people to safely pull out of the roadway to pick people up. The Police Department will be assisting the slug participants by directing them to the new location. The new location is close enough to the old location so the DOD bus stop should still be accessible. New State Department Line Starting (28 Mar 02) - A slug is trying to start a new slug line for the State Department beginning the First Week in April! There may be more information on the message board. Click here to go straight to the discussion. The slug line is only for Prince William County Commuters and Stafford County Commuters for easy access crossing the Memorial Bridge into Virginia. Major Changes to Rosslyn Slug Line - Effective 18 March 02 the Rosslyn Slug Line will relocate. Relocate the Rosslyn line to the area between North Moore and North Ft Myer on the Lee Highway service road and counterflow lane. Changes will also be made to Bus stopping locations. Arlington County will coordinate enforcement with Metrobus supervisors, transit police and Arlington Police. County official stated "We are working hard to support the slug line and am pleased that it has grown so much in Rosslyn that it has been noticed. Problems of success are far better than problems of failure." (referring to the number of people using this method of commuting). Is the new location just as convenient as the old location? Although it's not across the street from the Metro, it's only about 1.5 blocks away. Not only will it be more efficient and get you home faster than the old line but it has the full support of the county. With two lines instead of one, the flow of slugs/drivers should increase. In addition, it will be safer than the old location. 1) Split the line: one for Tackett's Mill/Potomac Mills/Horner and another for Stafford. 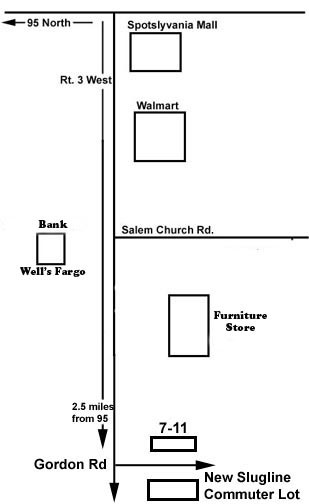 Leave the Tackett's Mill/Potomac in its current location and move the Stafford line near the corner of 19th and N. Moore Street (in front of McDonalds). The area in front of McDonalds has parking meters so if the city would post "no parking from 3:30 p.m. - 6:00 p.m." this would help prevent problems with those trying to use the meters.  Advantage - less disruptive than any other option and easiest to implement. Only half the slugs are moved. Retains the normal slug traffic flow so less driver confusion. Easy to access HOV.  Disadvantage is it may not completely relieve the congestion in front of the metro and does not resolve the issue with blocking the alley. Potential problem with parking meters. 2) Split the line: one for Tackett's Mill/Potomac Mills/Horner and another for Stafford. Move the Tackett's Mill/Potomac down about .5 blocks to the area in front of the park and move the Stafford line near the corner of 19th and N. Moore Street (in front of McDonalds). Like option #1 there are parking meters near both locations so if the city would post "no parking from 3:30 p.m. - 6:00 p.m." this might work. Otherwise, there may be problems with those trying to use the meters.  Advantage - less disruptive than most options and easy to implement. All slugs must relocate a very short distance but is close enough to original site that it would be accepted. Retains the normal slug traffic flow so less driver confusion. Resolves the issue with blocking the alley. Easy to access HOV.  Disadvantage- may not completely relieve the congestion in front of the metro. Potential problem with parking meters. 3) Move the line down one block to N. Moore and 19th Street but not all the way down to the far corner. This option would maintain the original traffic flow of slug drivers (travelling north on N. Moore Street) The line could be split into the Tackett's Mill/Potomac Mills/Horner and Stafford.  Advantage - All slugs must relocate a short distance but is still close enough to original site that it would probably be accepted. Retains the normal slug traffic flow so less driver confusion. Resolves the issue with blocking the alley. Relieves the congestion in front of the metro. Easy to access HOV.  Disadvantage - Far enough away from original site that slugs may resist moving. 4) Move the slug line to the east side of N. Fort Myers Drive (this is the split road) on the other side of the metro. This would be near the side entrance to the Metro. Again, the line could be split to reduce vehicle backups.  Advantage - Very close to Metro. Because of proximity to Metro this would probably be accepted. Resolves the issue with blocking the alley. Relieves the congestion in front of the metro. Easy to access HOV.  Disadvantage - Completely new slug area. Normal slug traffic flow is changed causing confusion. Harder to implement that options 1-3 because new site is not visually identifiable from old location (that is, from the old location someone cannot just point down the street to see the new locations). 5) Move the slug line to the west side of N. Fort Myers Drive. Directly across the street from the side entrance to the metro. Problem with this suggestion is it forces slugs to cross the street. Again, the line could be split to reduce vehicle backups.  Advantage - Close to Metro. Resolves the issue with blocking the alley. Relieves the congestion in front of the metro.  Disadvantage - Completely new slug area. Normal slug traffic flow is changed causing confusion. Harder to implement that options 1-3 because new site is not visually identifiable from old location (that is, from the old location someone cannot just point down the street to see the new locations). Slugs must cross to other side of very wide street. More difficult to access HOV. 7) Move the line down to the intersection of N. Ft. Myer Drive and & Lee Highway.  Advantage - Resolves the issue with blocking the alley. Relieves the congestion in front of the metro. Easy to access HOV.  Disadvantage - Completely new slug area. Normal slug traffic flow is changed causing confusion. Harder to implement that options 1-3 because new site is not visually identifiable from old location (that is, from the old location someone cannot just point down the street to see the new locations). Slugs must walk the longest distance of all options. Far enough away from original site that slugs may resist moving. A flyer is being developed and should be available by 13 March for printing or download. In an effort to avoid citations it is suggested that the slug line be moved to a less congested area. Your help in this matter is appreciated. Arlington County and their commuter assistance program has been a very active supporter of slugging! Head Slug walks the line of cars and calls out destinations instead of allowing the drivers to stack up. Another newsletter will be distributed as this issues gets resolved. Bob's (aka Long John Silver) UPDATE: this location has been fenced off forcing the slug line to move to the Circuit City parking lot. Fairfax County, who has been verysupportive of slugging in the past is working to resolve the problem. As soon as information is available, information will be posted on the website and distributed via the Slug-Lines.com Newsletter. 14th & G Slug Line Emerging - A new slug line is emerging between 14th & G Street. The destination is primarily for the Stafford 610 commuter lot and develops between 4:30 - 6 pm. Slugs have been holding 610 signs. Horner Road Gets Expanded...again! VDOT plans on expanding this lot this summer. I received the following information from a slug: "I corresponded with both VDOT and Prince William County and received an update on the Horner Road commuter lot expansion. The current expansion is slated for completion at the end August 2002. It will add a total of 1,337 spaces. According to my calculations the total number of spaces will eventually be 2,387, which can be compared to the original (pre-2001) total of 724 (information from VDOT website). The summer 2001 addition was 326 spaces making the current total 1,050. " OmniRide Starts Using New Pentagon Terminal - Starting Monday, December 17, OmniRide buses will begin service to the new Pentagon Bus Terminal. OmniRide buses have been assigned to the first and second bus bays (L1 and L2) on the lower level. Dale City (including Navy Yard), Montclair, Route 1 and South Route 1 buses will serve bay L1 while Lake Ridge, and Manassas buses will serve bay L2. For more information about the New Pentagon Transit Center, look for the brochure in the schedule rack. Downtown DC Passengers The AM OmniRide bus stop at 14th and Constitution near the Regan Building will be discontinued, effective Monday, December 17. Buses will continue to serve the mid-block stop directly in front the Regan Building. VDOT Public Meeting 17 Dec 01 - This public hearing is a Location & Design Public Hearing for Minnieville Road from Caton Hill Road to Old Bridge Road. It takes place Monday 17 December 2001, 5:00 - 8:00 PM at the Chinn Park Library Community Room. Prince William Square Enforcement (4 Dec 01)- The following message was posted on the message board from another slug: "A driver told me this morning that the Prince Wm Police were out last week to enforce restrictions on this lot. He said that there are now only about 25 spaces adjacent to Smoketown Rd. All the other spaces are now off limits due to the new medical center opening." L'Enfant adds Route 610 destination (1 Dec ) - A slugging provided the following information regarding L'Enfant Slug line: "L'Enfant to 610 is starting to pick up in the evenings. A reminder to slugs, please have 610 signs with you. Because of where the slug line is located, a lot of drivers do not even know the line is there. Last night, people in the front of the line didn't have 610 signs, said they didn't need them, and we all had to wait longer (the regular drivers came by). Have been picked up numerous times because drivers have seen the signs and not knew about the line." Route 110 Morning Access Changes (28 Nov) - Posting from message board "This morning, November 28, there was another traffic pattern established in the Pentagon area without advance notice. Specifically, I had 3 riders from the Fredericksburg area that needed to go to the Pentagon. I turned off the HOV lane at the Pentagon exit, turned left onto what had been the access road to 110, and saw a huge sign which read "110 Access Closed". Needless to say, that came as quite a shock. I was able to ask one of the security guards for directions, and ended up going back down Fern Street and cutting across Fern to 15th Street and then to the I-395, 110 route that runs beside the Pentagon. Does anyone know how long this traffic pattern will remain? Is it going to be permanent? Has anyone else found a better way to drop off Pentagon workers in the mornings? I work in Rosslyn and need to get onto either 110 or 27 to go to Wilson Boulevard. I'd appreciate any help you can provide." Bus service to the Pentagon will resume Dec. 16, with the opening of the new Pentagon bus facility. As a safety precaution, Pentagon bus service has been diverted to Pentagon City since Sept. 11. The new state-of-the-art bus facility will have an upper and lower platform, covered walkways, wind screens and a customer sales and service center for all your Metro needs. For more information, please visit the Pentagon Renovation Web site. Commuter Lot Crime (15 Nov 01) - The following was submitted by a slug on 14 Nov to warn others: "My car was broken into at the Horner Road commuter lot on November 13th. The windows were busted out and everything was taken. I called the police and they took a report, could not get fingerprints, and said that lot gets hit all the time! I was told the next morning by the driver that 3 other cars had been broken into that day. Then I went on to say I was going to start parking at Lakeridge and she said oh it happens there all the time too!!!! This is crazy! How can there not be patrol vehicles or cameras??? Horner Road is an 800 car parking lot where people are leaving their cars to go to WORK. Why isn't there a more safe way to commute?? I have decided for my own safety I will now metro. I had only slugged for 3 months and look where it got me. Please post this message. I am very curious to know how many other cars have been broken in to." I have report this to government officials. Pentagon Slug Lines Relocate Temporarily. The following was released on a 16 Sep via a DoD news release "Parking at the Pentagon will be limited due to staging areas related to the incident scene. Access to South Parking will be only through Fern Street in Pentagon City. North Parking will be open as usual, but with a reduced number of parking spaces. Individuals seeking to park in any Pentagon parking area will be required to show their building pass and a second form of identification. The slug line that usually forms in South Parking will be available on Fern Street, northbound at Army-Navy Drive." I am working with DOD to see if we can construct a detailed map on where each line will be. All registered slugs will receive emails. Please pass it along to other slugs. Prince William County staff has researched the old design for the Prince William Square development. Included in the approved design was a commitment for some commuter parking (probably not more than 64 spaces). We are discussing this with the management, who had been unfamiliar with this earlier commitment. They are very open to discussion of this item, but have indicated that level of parking has been exceeded consistently in the past (as many as 200 commuters, by their count) and would be a problem for them, given new tenants. We're trying to work out something with them. We'll let you know. In the meantime they have committed to not tow vehicles and to continue discussions. While I have only been in one direct conversation with the management, they appear to have been very helpful throughout the process, so I hope we can come to a reconciliation of this item soon. " Prince William Square Parking Problems (19 July 01) - The following information was sent from Ms. Ruth T. Griggs, Occoquan District Supervisor : " I am sending this out to everyone who contacted me about Prince William Square. I am sorry for all the confusion. The Prince William Square shopping center (across from Potomac Mills Mall) has asked commuters to move on from their lot. I spoke with the property manager this morning. He indicated that he is unaware of the property ever granting commuters permission to use the lot. However, they never had a reason to enforce no parking in the past, due to the significant number of vacant stores in this strip center. Those vacant spaces are about to fill, and they need the parking spaces. In the meantime their management has agreed to put the flyer below on vehicles to help ease the pain of moving commuters on from this spot. We are aware that commuters have been asked to move their cars from this lot. Alternative sites for commuter parking are available at the Hillendale Fire Station (corner of Hillendale Road and Dale Blvd), Boys & Girls Club (5070 Dale Blvd), and the PRTC building (off of Telegraph Road). In addition, the VDOT lot at Rt. 123 and I-95 has plenty of available space and improved access for commuters and car-poolers. Also, the Horner Road lot opened 300 additional spaces on 9 July 2001 and will add more spaces within the next 6 months. If you have any questions, please contact Ruth Griggs, Occoquan District Supervisor at (703) 792-4644, (703) 792-4643, or email rgriggs@pwcgov.org. Improvements Planned for the Pentagon Slug Lines (22 June 01) - The following information is from the Design Manager for the new Metro Entrance Facility project at the Pentagon. "We have just entered the final phase of construction on the new bus terminal. The new terminal will be adjacent to the existing terminal and will be completed in November of 2001. The new facility is designed to eliminate the pedestrian/bus conflicts present at the existing terminal. The new facility will also provide a direct link from the subway entrance and the bus terminal to the Fern Street slug lines. The only impact to sluggers will be the relocation of the Springfield line which forms at the last bus bay in the current terminal. WMATA has agreed to assign the bus bay closest to N. Rotary Road to the PRTC Dale City, Montclair bus. This will allow the existing Springfield slug line to operate in November as it does today. The locations of all other slug lines will not be altered. Fern St. lines will operate throughout construction as they did before we began work. Finally, there are a couple of things we are doing to improve access to the slug lines on Fern Street. Yesterday, we opened a new traffic lane on N. Rotary Road for slug use only. This new lane was created to give sluggers headed to Stafford and Fredericksburg a dedicated lane the entire length of N. Rotary Road from Eads St. to Fern St. Hopefully, this will speed their journey since they will no longer have to wait for sluggers headed to lines #1-5 to pass through the Fern Street intersection. We are also preparing to add an additional slug only lane on S. Rotary Road on the approach to Fern Street. This will give sluggers an opportunity to pull off S. Rotary Road 200 feet before the Fern Street intersection and enter the pick up lane for lines #1-4. This modification will begin in the near future and should have no impacts on the existing circulation. Throughout construction, officers from our Defense Protective Service will be on-hand during morning and evening rush hours to assist with traffic flow. It is our goal to get all buses and sluggers through South Parking as quickly as possible. Additional information on the project can be found at http://metro.pentagon.mil I hope I have answered your questions and provided you the information you are looking for. I have approached both the American Legion and Circuit City to seek permission for relocation of the Slug Line. In both instances, the parties declined. At this time, I do not have any other options in that immediate area unless sluggers wish to relocate to Springfield Plaza, which is not as convenient. In addition, I am seeking your cooperation beginning tomorrow morning (April 11). RIDERS PLEASE STAND ON THE OPPOSITE SIDE of Long John Silver's restaurant to connect with drivers. This change has been precipitated by closure of one of the access driveways. VDOT's contractor currently is installing overhead utility wires, so that drivers must enter and exit at only one driveway which is creating traffic backups on Old Keene Mill Road. DRIVERS PLEASE GO AROUND LONG JOHN SILVER'S RESTAURANT PRIOR TO PICKING UP RIDERS. This will permit a longer queue within the parking area. Your willingness to facilitate this change is greatly appreciated. I will try to assign a staff person to the site tomorrow morning and the following morning, if possible, to direct both riders and drivers to the appropriate location. In addition, the Fairfax County Police Department is aware of the situation; however, police presence is not permitted on private property unless requested by the property owner. Keep up the true Slugging Tradition!! Dottie Cousineau Fairfax County DOT"
Why Not Dale City (27 Mar 01) - A slug sent the following that has been posted both the "hot update" page and on the public message board. Some very good points are brought out and is worth considering. "I'm trying to gauge the interest in a Dale City slug line. There are 3 large, well-lit commuter lots along Dale Blvd convenient to the HOV without getting on I-95 itself. The lots are all county maintained for commuting & always have many empty spaces. The locations are Dale & Lindendale (approx 4 miles fm HOV), Dale & Minnieville (behind Giant, 2 miles fm HOV), and Dale & Gideon (in front of Kmart, small lot, 1/4 mile fm HOV). Far better & safer than nearby Montclair where there are 2 lines with no lights, little parking, hostile residents, and somewhat hazardous locations (traffic-wise). Pls respond via this msg board if interested & give your preferred location. If there is enough response I'll start the process w/e-mail postings, & other info media. Thanks for your time!" Sydenstriker Lot Update from Slug (8 Mar 01) - "There's an active slug line at the communter lot that's just off Fairfax County Parkway on the north side at the corner of Hooes Rd. & Sydenstiicker (sp?). The lot opened last fall. I think it has about 200 spaces. Mid-week, the lot fills up between 7:30 & 7:45 am. Drivers still pick up there after the lot is full. I think people walk from the neighborhood or park on the streets. I've heard rumors of additional parking at the church across Hooes Rd., but don't know if the church really allows this. The standard destination is Pentagon. Don't know to what extent this lot has replaced the old Gambril Mobil line. There are still cars parked on the shoulder of Hooes Rd. by the Mobil station." Click here for link to Sydenstriker Slug line.